Press "Game Select" until "5" is selected for a game of classic Spacewar. Activate the "Game Reset" switch to start a game. Javatari.js (v4.0.1) Atari VCS emulation by Paulo A. Peccin: Project Homepage. See www.masswerk.at/spacewar for the original Spacewar! game (1961/62). 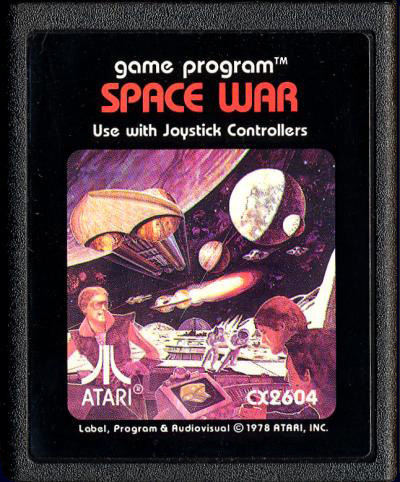 Original game cartridge & artwork © 1978 Atari, Inc.
You and your opponent blast off into space. Each player controls one Star Ship with the Joystick Controller. The object is to score points by shooting your opponent's Star Ship with missiles fired by the red button on your Joystick Controller. Aim the nose of your Star Ship in the direction you want to fire. SPACE WAR games last ten minutes or until one player scores ten points. Player's scores appear at the top of the playfield and are color coordinated with the Star Ships. The two lines to the right of your score refer to fuel and missile supply. The top line is the fuel gauge; the bottom line is the amount of missiles remaining. Each player begins with eight missiles. Once the arsenal is depleted, the game will automatically reset each player with eight more missiles ONLY when both players are out of missiles. In most SPACE WAR games, fuel cannot be resupplied. In games 6 and 7, players can refuel and resupply missiles by docking with the Starbase. Fuel is used by adding "thrust" to your Star Ship or by putting your Ship into Hyperspace. GAME 1 It's war in space as two players attempt to score 10 points first. You have Galaxy boundaries in this game. GAME 2 Engage in combat in a galaxy which features Galaxy Boundaries and Hyperspace. GAME 3 Oppose your space opponent in a galaxy which has Warp Drive. Use Hyperspace as a defensive move. GAME 4 The Space Sun in the center of the galaxy exerts gravity during combat. Avoid your opponent or collision with the Space Sun by using Hyperspace. You also fight within Galaxy Boundaries. GAME 5 The Space Sun, Warp Drive, and Hyperspace are the features of the galaxy playfield. GAME 6 You can refuel and receive more missiles at any time during this game. Steer your Star Ship to the Starbase. This galaxy also features Galaxy Boundaries and Hyperspace. GAME 7 Steer your Star Ship to the Starbase at any time during the game to refuel or receive more missiles. This galaxy also features Warp Drive and Hyperspace. The object is to connect your Star Ship with the Space Module, and score. The recommended strategy is to first match your Star Ship's speed to the Space Module's speed. Then slowly maneuver your Star Ship towards the Space Module. During Shuttle games the Star Ships have an unlimited supply of fuel. In one-player games, you control one Star Ship with the left Joystick Controller and compete against the clock. You have ten minutes to score a maximum ten points. During two-player games each player maneuvers his Star Ship to score. In two-player games with two Space Modules, the target Space Module will be the same color as your Star Ship. First player to score ten points or the most points in ten minutes wins. GAME 8 Two players each control one Star Ship and attempt to connect with the Module which is color coordinated with the Ship. Warp Drive is present in this galaxy. GAME 9 Two players each control one Star Ship and compete to connect with the same Space Module. This galaxy features Warp Drive. GAME 10 Each player controls a Star Ship and attempts to connect with a color coordinated Space Module. This galaxy has a Space Sun and Galaxy Boundaries. GAME 12 Galaxy Boundaries characterize this galaxy. Each player controls a Star Ship and attempts to connect to the same Space Module. GAME 13 Each player controls a Star Ship and attempts to connect with the Space Module that is color coordinated to the Star Ship. Galaxy boundaries are featured. GAME 14 One player controls a Star Ship and attempts to connect with the Space Module. This galaxy features Warp Drive. GAME 15 A Space Sun and Warp Drive characterize this space galaxy. One player steers the Star Ship to connect with the Space Module. GAME 16 One player controls a Star Ship and attempts to dock it with the Space Module. Galaxy Boundaries characterize this playfield. GAME 17 A Space Sun and Galaxy Boundaries could affect one player's strategy to connect the Star Ship with the Space Module. Model CX2604, © 1978 ATARI, INC.